For the past five and half years, I have been undertaking research examining the representation of council estates (or social housing estates) across a number of divergent theatre practices (mainstream, applied and site-specific). In September 2013 I attended a fascinating event, run by artist Jordan McKenzie as part of the Live Art Development Agency’s DIY Series. This event, titled ‘Look at the E(s)tate We’re in’, was a gathering of artists, academics and activists whose work engaged with council estate sites. Below I have posted my review of this event, originally published on Interface. 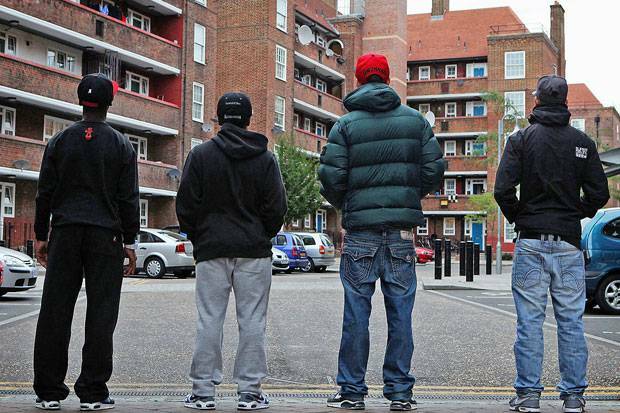 ‘Council estates are iconic sites of urban deprivation. In contemporary popular representations – on film, television and in the newspaper press – estates are often called upon to symbolise poverty, crime and struggle. Council estates are also regularly implicated in political rhetoric regarding the welfare state. For example, when the coalition government recently introduced the ‘spare bedroom tax’, a reduction in housing benefit for any claimants who were deemed to have a ‘spare bedroom’, they invoked the concept of the ‘shirker’ or ‘scrounger’ – the lazy, benefit dependant council estate resident that they had used to justify wider benefit cuts. Because of the national interest in council estate sites, and because they are often presumed to house communities of social renters who are vulnerable and economically marginalised – despite the fact that, in reality, estates are home to a diverse range of residents including professionals, homeowners, artists and private renters – council estates have become fertile sites for socially engaged arts practices. Look At The E(s)tate We’re In (LATEWI) was a three day mini summit for five artists whose work centres around socially engaged practice, funded by the Live Art Development Agency as part of their DIY series – where artists run unusual training and development workshops for other artists. I attended the summit for research purposes – I am currently undertaking a PhD that interrogates representations of the council estate. The event was hosted by Jordan McKenzie, an artist and estate resident who ran LUPA (Lock-Up Performance Art), a series of live art works staged in a garage on the Approach Estate in Bethnal Green, where he lives, and where the summit took place. LATEWI sought to address the following questions: Does working locally and employing notions of localism in artistic processes provide an oppositional critique of globalisation or foster insular and conservative attitudes to artistic and social exchange? Is the notion of community important given the attacks on estates by the government or does it fail to represent the particular and autonomous nature of social relations? How do artists create ‘authentic’ relations in terms of social engagement without it seeming that an artist parachutes in to perform it and then leave again effectively reducing it to another artistic practice? What indeed do we mean by authentic in this context? Over the three days attendees engaged in a series of micro-encounters. These included talks by prominent artists and academics concerned with participatory arts practices – such as Bobby Lloyd whose recent projects include ‘the drawing shed’, an arts organisation that uses mobile studios to create arts projects on two housing estates in E17, and Dr Nic Ridout who offered a provocation on the powers of spectatorship, arguing that participation might, sometimes, work as a substitute for taking part in political action. Artists were also invited to engage with estate residents, in a series of one-to-one meetings, where residents spoke about their own experiences of the estate and the surrounding area, and which might provoke stimulus for future collaborations. The summit also allowed space for the attending artists to reflect on their own work and a chance to share and discuss practice. This fostered stimulating and memorable conversations, particularly around the notion of rights to representation and the ethics of socially engaged art. We asked whether and how arts practitioners should work with communities they are not part of, and speculated on the role of the social artist in a neoliberal economy – where artists are often employed by institutions on a short term basis, and expected to carry out social and political work that they are not necessarily trained for. The scope and breadth of work discussed over the three days led us to consider whether council estate practice might be considered a category of socially engaged art in its own right. Although artistic engagements with council estates have happened since at least the mid twentieth century, we speculated that the proliferation of council estate art in the past ten years might mark a definable historical moment in socially engaged work.